Because I love games, the uninitiated often ask me about what tabletop wonders they should bring into their own homes. Below are my most frequent recommendations, vaguely arranged in ascending necessity of play. Love Letter: The portability of Love Letter is one of its great strengths. Housed in a tiny drawstring bag, it consists of only 16 cards. This, along with its play time—less than five minutes per round—and low player count makes it the perfect game to throw in your bag for deployment during various down times: waiting for a table, before a movie, over coffee, etc. Players compete to deliver a stream of sweet nothings to their lady love, the Princess Annette, in an effort to win her hand, inciting an intricate dance of courtly deduction and cat-and-mouse intrigue. The game often culminates in raised voices over failed ploys and heated discussions concerning gender roles and casual sexism. Bohnanza: Like beans? Like trading beans? Like planting beans? If so, master game designer Uwe Rosenberg‘s fast-paced bean-based German-laced micro-economy game, Bohnanza, was made for you. Bohnanza is the sophisticated prodigal son of the popular stock market emulator: Pit. The ingenious hand management mechanics make for a game unlike anything you are used to and leaves room for flagrant misuse of your fellow players. It pits (!) players against one another: in a fevered battle of negotiation and bribery, it is decided, once and for all, who among them is the best beanist. 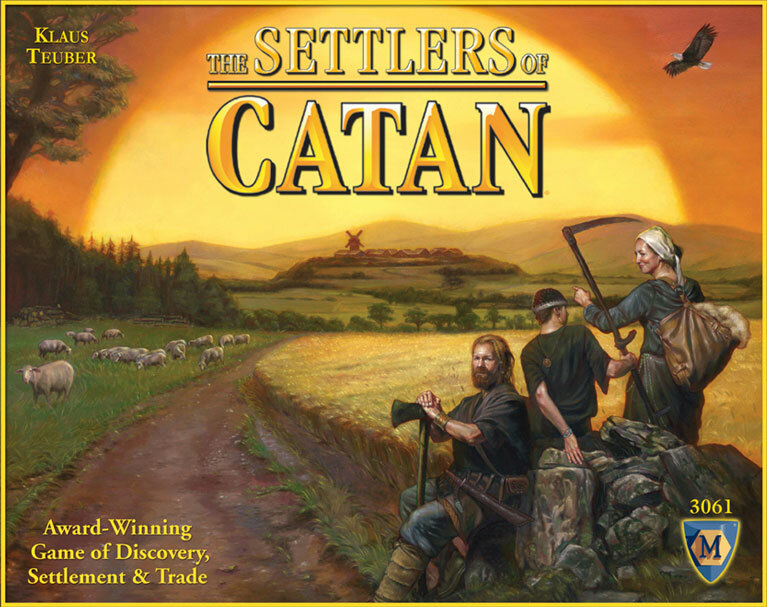 Catan: I include this in the list only as a sad replacement for the devilishly complex Agricola (my favorite game). I’ll admit I have grown a bit tired of Catan. But, some things are not for me to decide. History has made Catan a mandatory feature on nearly every gaming list of the past decade for one reason: Catan was the game that drudged the American gaming world out of the dark age of Monopoly and launched it, heaving, onto European shores. It brought us to a new world, a utopia rife with tabletop treasures yearning to be discovered. Is it a good game? Yes. Great? That’s debatable. It can run long, become repetitive and be positively nasty if the robber is abused. But it provides a fairly good time, and honestly, despite its shortcomings, it is a game that deserves to be played. Hive: Hive shares a similar root with abstract strategy games such as Chess or Go, but it tries to oust these classics by presenting a more streamlined package: lower learning curve, faster game play, and higher portability. Despite it’s relative simplicity, the game is not without stakes or depth. Players use their individual bands of creepy crawlies to dominate the shifting board, and carry out nuanced strategies to stoke the tension between the two warring colonies. A great way for chess players to convince their weary friends to lose in a brand new way. 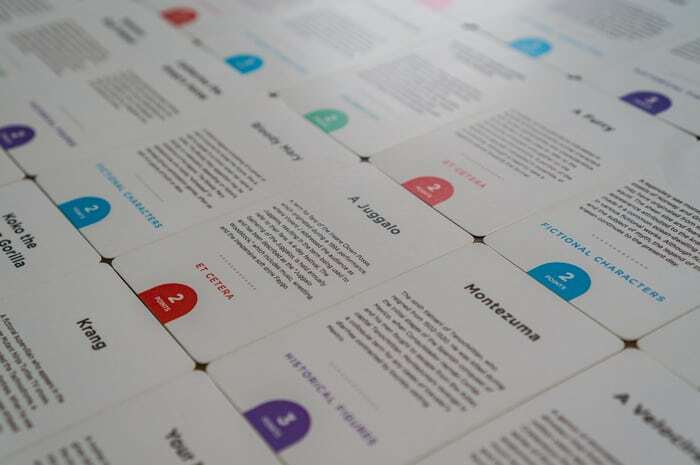 Monikers: This game triumphs over other party-style games like Apples to Apples or Charades (and especially Cards Against Humanity) by allowing you to connect directly to your friends, flattening the boundaries of structure, embarrassment, and social distaste. I haven’t tried this wonderful new edition personally, but I’ve found home-brewed versions of the game to be equally thrilling. The fun I’ve had playing the game has been rivaled only by the fun I’ve had balking at the dark inventive reassesses of my friends’ minds as they come up with new cards. Also, bonus: making up your own cards costs you nothing! Smash Up: Have you ever wanted to dive into a trading card game like Magic: The Gathering, but lacked the time, money, or intellect? Then Smash Up is the game for you. Self-contained, combo-filled and wonderfully chaotic, Smash Up is as addictive as it is fun. The unique set up lets you choose your two favorite fictional factions of fantasy fighters (ninjas, pirates, zombies etc.) and shuffle them into one heaping deck of awesome. Players then deploy their custom decks to do battle against one another. Chaos abounds. I’ve pulled all-nighters based exclusively around exploring the dozens of deck combinations possible with only the base set. SMASH UP!!! Coup: If Smash Up is the raging bionic hulk charging over an arid mesa towards a wall of dynamite, then Coup is the gorgeous courtly maiden poised to stab you in the mouth as you sneeze. Coup is both nasty and wonderful, both subtle and brash. It takes the thrill of a glorious round of poker and refines it down to only its essential parts: lying and scooping up chips. This game is often astoundingly tense. I’ve witnessed triple layered bluffs seem to crumble, only to be revealed at the last moment to be devastating quadruple bluffs in disguise. The game’s infamous mantra, “Three with my Duke,” has inspired a countless number of pitiful groans and dancing eyebrows. 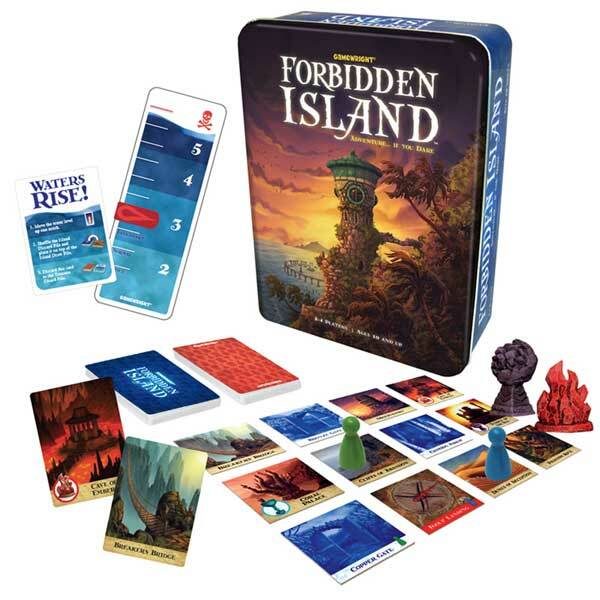 Forbidden Island: Cooperative games tend to have a bad rap. I played a good deal of them as a kid, and they all seemed to present something either condescending or easy, clearly pandering to its young demographic. Fortunately, Forbidden Island shrugs off all preconceptions that you might have about cooperative games. It is terrifying. It is difficult. It is good. The game conducts a perfect symphony of challenge building to a crescendo: rising tides, shrinking options, and crumbling islands. The players are explorers who must find the four treasures hidden throughout the island and fly to safety before the very ground they’re standing on disappears forever. An excellent family bonding game. 7 Wonders: I’ll admit, this suggestion is of a complexity that most uninitiated readers might find daunting. But, boy, is it worth it. I find empire building games fascinating and 7 Wonders is a lovely little distillation of that theme. Players are each offered the opportunity to take on the role of one of the great civilizations responsible for the seven wonders of the ancient world. As eons progress, players vie for increasingly scarce resources, clash with neighboring forces, and attempt to solve the world’s problems one cuneiform tablet at a time. It is also unique in that it plays perfectly with anywhere from two to seven players. 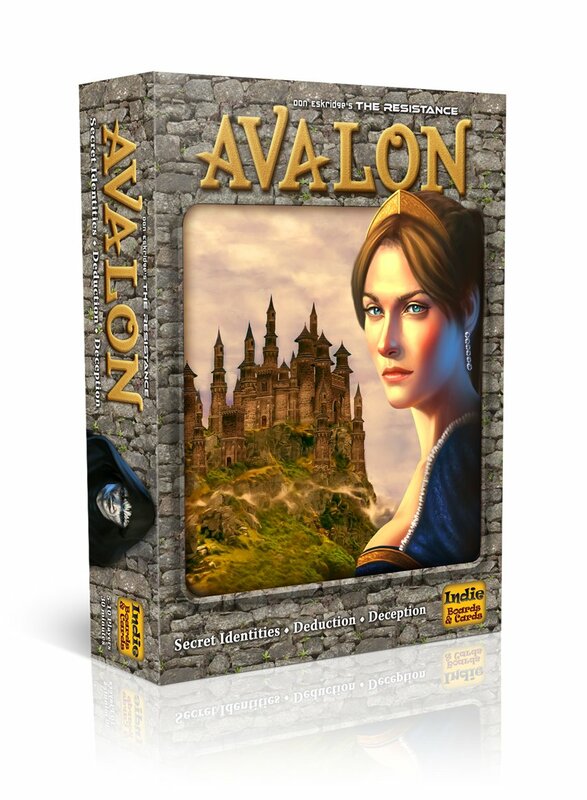 Avalon: As I’ve said before, Avalon is a special slice of my obsession. It has a lot to give, and its strategical depth is well worth the time it takes to master. Try it. If you dislike it, fine. If your friends are appalled by it, fine. But please, give it a chance. That’s all I’ve got. If you’ve never played any of these games, I urge you to try one that appeals to you. Board gaming is a very rich hobby: even if you lack the passion to become obsessed with it, the connection gained through playing a game with a group of friends or family is hard to gain as easily through any other means. If you have any questions about what game is right for you, don’t hesitate to ask. You need a more “link bait” title. Look at Buzzfeed for inspiration. I could imagine this post being called “10 Bizarre Games Serial Players Loved”. Or something like that.